Updated: Civ6 DX12 patch now live. AMD has a new hotfix (16.11.4) available for Radeon graphics card owners and guess what? 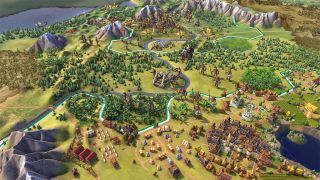 It introduces DirectX 12 support for Civilization 6! Just kidding (apologies to anyone who just spit coffee onto their monitor in surprised delight), Firaxis and AMD are still working on that. Update: The DirectX 12 patch finally went live, just half a day later than expected. Along with Civ6 getting DX12 support, this driver release helps to ensure everything works optimally with the new DX12 code. Radeon R9 Fury Series products may experience minor graphical corruption in Titanfall 2 when inside a titan. DOOM may experience a crash when launched using the Vulkan API on some Graphics Core Next products. You can download the latest Crimson hotfix direct from AMD.